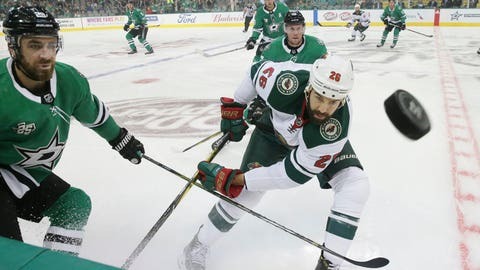 Minnesota Wild right wing Daniel Winnik and Dallas Stars defenseman Greg Pateryn chase the puck during the first period. In Dallas, Tyler Seguin scored two goals to push the Dallas Stars to a 4-1 win over the Minnesota Wild. Seguin’s first goal at 9:52 of the second period lifted Dallas to a 2-0 lead. His empty-netter with 2:43 left in regulation sealed the victory. Jason Dickinson and Tyler Pitlick also scored for the Stars, and Kari Lehtonen made 32 saves. Jason Zucker scored Minnesota’s lone goal, and Alex Stalock stopped 33 shots.